Wightman Telecom is a company founded on the "people come first" principle. Imagine, a Telecom company that has real, live people who will answer your call. A local company that is just a short drive or call away. Find out what our customers are saying about us. When phone service came to Clifford in the early 1900's, Robert Wightman, a farmer in nearby Howick Township, desperately wanted to have service on his farm. When Bell would not meet Robert's request for phone service, Robert decided to start his own phone company by stringing lines from his farm to his neighbours throughout the township. 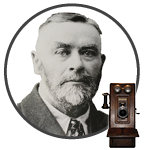 He connected sixty of his neighbours, and was able to connect into the Bell long distance lines at Clifford in 1911. In 1928, Robert retired and handed over the management of the Robert Wightman Telephone Company to his son Ben. In 1928, Ben Wightman purchased the Clifford, Ayton, and Neustadt exchanges. 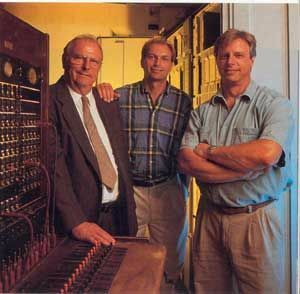 After Ben’s death in 1948, Leila, his widow, and their son, Ray, took over the company and soon purchased automated dial technology, ending the era of the Switchboard Operator. An ice storm destroyed Wightman’s phone lines in 1954, leading to the installation of underground cabling. Wightman Telephone also bought several small local exchanges, including Normanby, Bentinck, Wroxeter, and Howick. In 2006, Leila was inducted into Canada's Telecommunications Hall of Fame. 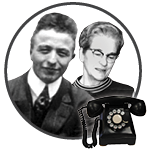 Ray joined the company in 1948 , when his father died, and worked closely with his mother, to bring Wightman Telephone into the modern era. Upon Leila’s death in 1976, Ray took full command of the company, and lead it until his retirement in 1987. 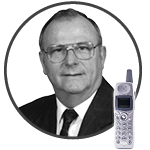 During Ray’s tenure, Wightman Telephone saw the deregulation of phone sets, the introduction of the cellular phone, and the incorporation of Wightman Contracting. In 1995, Ray was awarded a Life Membership by the Ontario Telephone Association, and in 2007, Ray was inducted into the Ontario Agricultural Hall of Fame. Paul and Blair took over the company when their father, Ray, retired in 1987. 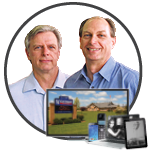 In 1995, Paul and Blair introduced the Internet (which was at that time a new service), providing a high-speed connection to rural Ontario long before it was introduced into larger cities. In 2008, Wightman made a huge advance in delivering services by introducing Fibre to the Home. In the last decade, Wightman has invested heavily in bringing this modern and future-proof communications infrastructure to you, our customers. Whatever the technology of the future demands, Fibre to the Home will be ready for it. Passed from generation to generation. (From left) Ray Wightman and his two sons, Blair and Paul Wightman. Find out how we're living these values every day. To be the peoples trusted choice in the communities we serve. We are passionate about providing the best possible experience in every interaction. We are a family of great people who want to deliver wow experiences each and every day. 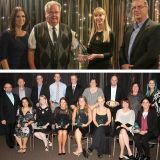 On October 25, 2017, Wightman received the Large Business of the Year Award at the North Perth Chamber of Commerce Excellence Awards! Pictured with Hope Reidt and Jack Walsh in the top photo are the Large Business of the Year Award Sponsors Deborah Cherrey and Allan Cherrey of Cherrey Bus Lines. On May 16, we were honoured to win the Customer Service Excellence Award from the Centre Wellington Chamber of Commerce. We would like to thank the judges, other sponsors, and emcee, Rob Dutton, and everyone who came out to support local business in Centre Wellington. Pictured are (L-R) Jack Walsh, VP Customer Care and Acquisition; Jackie Ferguson, Business Sales; Hope Reidt, Marketing Manager; and Ted Smith of Collins Barrow. On April 28, 2017, we were honoured to win two awards from the Minto Chamber of Commerce. This award is presented to a company which has had an impact on the Minto Community and has more than 10 employees. This award is presented to a business who has provided exceptional customer service by consistently offering a high quality of service to all customers and by going above and beyond the call of duty to provide service to a customer in extenuating circumstances. Wightman Telecom and Crimestoppers Guelph-Wellington were awarded the Ontario Association of Crimestoppers Best Long Video Award (Population Under 300,000). Pictured above from left to right: Hope Reidt, Marketing Manager - Wightman; Sarah Bowers-Peter, Guelph-Wellington Crimestoppers; Adam Olivero, Local TV Channel Producer, Wightman; and Rob Figliuzzi, President & CEO, Wightman. Wightman Telecom was the awarded the first-ever Large Business of the Year award at the 2014 North Perth Business Excellence Awards! Pictured at left are, L-R: Customer Care Representative Janelle, Marketing Manager Hope Reidt, Senior Sales Account Manager Barry Metcalfe, and Local Content Producer Adam Olivero. Pictured at right are Robertson (back row, left) with the other 2014 North Perth Business of Excellence Award recipients. Congratulations to all the award nominees and recipients! Wightman Telecom won the Employer of Excellence Award for the third year in a row! Pictured on the left are, Back Row L-R: Local Content Producer Adam Olivero (holding camera), and Customer Care Manager (Field Operations) Michael Hawkes. Front Row, L-R: Customer Care Representative Janelle and Marketing Manager Hope Reidt. Pictured below are Reidt (front row, left) with the other 2013 North Perth Business of Excellence Award recipients.